With globalization, enterprises are increasingly distributed across the globe. FileCloud helps teams work seamlessly from anywhere and collaborate as if they are located in the same office. 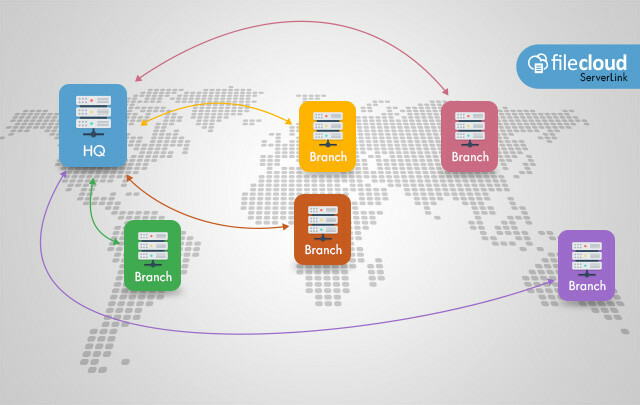 A single file server in the headquarters wouldn’t be able to provide same level of performance to branch offices that are located across continents. With a single server, users in remote branch offices will observe latency when accessing files remotely. To alleviate the problem, the branch offices can have their own FileCloud instance and FileCloud ServerLink technology synchronizes files across multiple FileCloud instances. Each branch office instance mirrors the main FileCloud server at HQ. FileCloud not only replicated files/folders but it also replicates all related data such as users, groups, comments etc. FileCloud provides the flexibility to organizations to run branch office FileCloud instances on variety of infrastructure and OS. FileCloud ServerLink technology handles the complexity in the background and keeps these instances in sync. With one simple pricing, organizations get the full benefit of branch office. Cross-office synchronization enables tighter integration across team to deliver their products, services and supporting functions. Benefits significantly outweighs the cost.